Satin sponge pudding with fresh apple and sweet blackberries, baked and glazed.Vanilla Sponge [S..
Classic truffle mousse finished with a white chocolate truffle.IngredientsCream (Milk), Dark.. Individual handmade desserts, blackcurrants with a hint of lemon and a cheesecake filling set on a s.. Cream (MILK) (38%), Custard (Full Cream MILK, Cream (MILK), Sugar, Whole EGG, Modified Maize Starch,.. Individual Cherry Chocolate CharlottesRich chocolate mousse with cherries in centre surrounded b..
Sticky chocolate & sweet cherry in this delicious pudding.IngredientsSugar, Water, Wheat..
Chocolate and Toffee Puddings with A Caramel SauceChocolate Brownie Sponge (57%) [Sugar, Wa..
Rich, smooth Belgian chocolate mousse topped with mars, snickers, flake and maltesers drizzled in c..
Soft centre flavoured with Irish cream liqueur and topped with Belgian chocolate truffle.Ingredi..
Rich dark and robust Belgian chocolate truffle with white chocolate and coffee liqueur (Tia Maria) c..
Rich sweet honeycomb with white and and dark chocolate truffle mousse and caramel curls.Ingredie..
Tangy lemon cream blended with rich cheesecake and crispy meringue, finished with lemon curd.Ing.. Lemon & lime, fresh cream and meringue in this delicious mousseIngredientsWater, Cream (.. 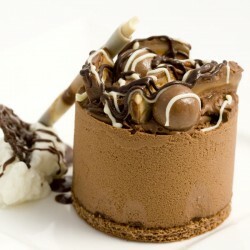 Handmade mini dessert with three layers of fine chocolate mousseIngredientsCream (Milk) (39%..